White throated kingfisher is a large kingfisher. It is found commonly throughout India. It is a tree kingfisher and can also be found away from water. White throated kingfisher is a state bird of West Bengal. In this article we explore where to spot this bird and learn more about its habits and habitat. White throated kingfisher is found in variety of habitats including the plains with trees, wires or other perches. Nest-building is done by both male and female. Nest is a tunnel dug in an earth bank. Nest is dug using their bill. Occasionally, nest tunnels in the haystack have also been noted. White-throated kingfishers mainly feed on large crustaceans, insects, earthworms, rodents, snakes, fish and frogs. It has been also noted to feed on small birds, chicks of sparrow, red-wattle lapwing etc. Though it takes bath regularly, it drinks water rarely. White-throated kingfishers back, wings and tail are bright blue. Head, shoulders, flanks and lower belly are chestnut. The throat and breast are white. The bill is large and bright red, with bright red legs. The wings are short and rounded. Both sexes are similar. Juveniles are a duller. 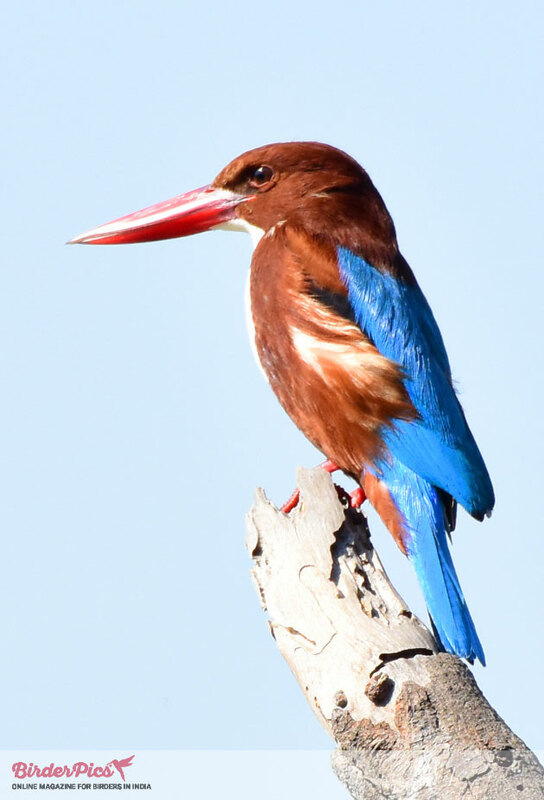 The white-throated kingfisher’s breeding season begins with the onset of the monsoons. Male is found in the early morning perched on prominent high from where he makes a call. Courtship display includes flicking of tail. Wings are also stiffly flicked open for a second or two. Male also raises their bill high and display the white throat and front. The female in invitation makes a rapid and prolonged kit-kit-kit… call. The clutch usually has 4-7 eggs. The eggs hatch in 20–22 days. Chicks fledged in 19 days.